Morality is the human attempt to define what is right and wrong about our actions and thoughts, and what is good and bad about our being who we are. It can be a body of standards or principles derived from a code of conduct from a particular philosophy, religion, or culture, or it can derive from a standard that a person believes should be universal. 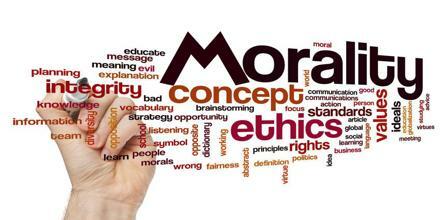 Conformance to a recognized code, doctrine, or system of rules of what is right or wrong and to behave accordingly. No system of morality is accepted as universal, and the answers to the question “What is morality?” differ sharply from place to place, group to group, and time to time. Which Internal Factors Affecting Recruitment?